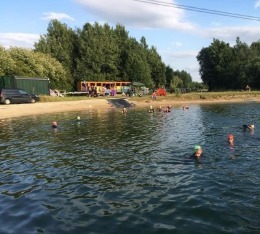 During the Summer months we run 3 open water swimming sessions per week. The start and end dates are determined by the water temperature of the lake. These sessions are open to everyone (see age restrictions below). You can book and pay for sessions online by clicking book now next the session you wish to book. You can also purchase a membership which significantly reduces the cost of sessions and allows you to block book. If you want to save time when you arrive please ensure you book in advance by selecting the session you want to attend below. This way you can head straight to our speedy check-in queue where you will be booked in and given your swim wrist band. Please note each swimmer must have their own individual account on the system to allow them to be booked in for a swim. Accounts can be linked to share swim credits (share pricing options). Please take time to familiarise yourself with our venue and rules by watching our explainer videos below. **Polite Notice** Please be aware that Dogs or other pets are not allowed onsite at anytime. Guide & Assistance Dogs are welcome but please drop us a message to advise us. Wetsuits are optional (with the use of a tow float) if the water temperature exceeds 18ºC and mandatory at all other times. The Blue Lagooners Management reserve the right to request to test the suitability of a swimmers Tow float & wetsuit for buoyancy & suitability for swimming and reserve the right to refuse access to the water if a swimmers wetsuit or tow float is deemed unsuitable and/or unsafe for swimming. Please check out the videos below that explain why this is so important. Please note that junior swimmers (aged 12 to 17 years old) must undergo a briefing & swim assessment by one of our lead safety crew on their first visit. This must be booked in advance. There is no charge for the assessment. This process takes approximately 10 minutes and once the crew member has approved the junior swimmers ability & understanding of the rules the athlete may continue with the rest of the session. Junior members must be accompanied by a parent or guardian at all times at all club sessions. The Blue Lagooners Management reserve the right to rescind access to sessions if they have concerns for the safety of an athlete or others due to ability and/or behaviour. How to check-in & where to go. In this video we give you a guided tour of the Blue Lagoon and show you where to go when you arrive. We'll show you where to check in to get your swim wristband, where to get changed and what to do once you've completed your swim. Most importantly we'll show you where the cafe is for that post swim brew and bacon sarnie! At the Blue Lagoon we have a superb swim course that caters for everyone. in this video we show you the layout and how you can get the most out of your session. This video also includes rules of the swim such as swim direction and etiquette to ensure everyone stays safe and has a fun swim. Swim Safety & What to do if you need help. In this video we show you how our swim safety works and what you need to do should you need any assistance during your swim. This includes everything from just a little support from one of our paddlers to help you with a minor problem such as leaky goggles or a wetsuit malfunction, right though to what you need to do if you need recovering from the water by our rescue craft. It also covers what you need to be aware of if we are recovering another swimmer during your swim. Please remember our crew are there to support you and please don't be afraid to ask for assistance. There's no shame in getting a lift back to shore if you need it. We'd rather this than you struggle. 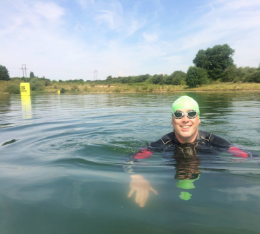 In this video Coach Morg demonstrates the importance of having a wetsuit that will keep you buoyant should you get in to difficulty whilst swimming. 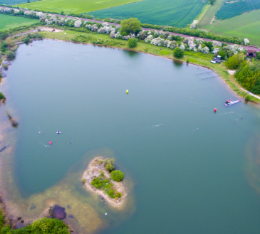 Serious incidents are very rare but even a mild bit of cramping can send the most experienced open water swimmer in to a panic and need assistance. Wetsuits are mandatory at all times. The Blue Lagooners Management reserve the right to request to test the suitability of a swimmers wetsuit for buoyancy, warmth & suitability for swimming and reserve the right to refuse access to the water if a swimmers wetsuit is deemed unsuitable and/or unsafe for swimming. *In the spring we wait until the water is holding at least 14ºC overnight to ensure it remains above the minimum temperature for swimming. Wetsuits are mandatory when the water temperature is below 18ºc. Above 18ºc wetsuits are optional but non wetsuit swimmers must used an approved Tow Float. The Blue Lagooners Management reserve the right to request to test the suitability of a swimmers wetsuit or tow float for buoyancy, & suitability for swimming and reserve the right to refuse access to the water if a swimmers wetsuit or tow float is deemed unsuitable and/or unsafe for swimming. Please check out the videos above that explain why this is so important.